We’ve been big fans of Her Universe for several years now and they’ve got a huge presence at San Diego Comic-Con this year with panels and events throughout the whole of the event this year. Take a look at how you can catch up with Ashley Eckstein and her fabulous geeky empire. Dave Filoni, supervising director, and special guests will share a look back at the show and its many incredible stories. Presented by Her Universe, Hot Topic and Loungefly in partnership with Cartoon Network, Singer, Zenni and BoxLunch. 24 designers will compete, with their original “geek couture” designs, for the chance to win the ultimate prize – an opportunity to design a Her Universe fashion collection for Hot Topic. Hosted by actress and Her Universe Founder Ashley Eckstein. Want to get in to the business of geek fashion? Calling all designers, artists, lawyers, entrepreneurs; join Founder of Her Universe, Ashley Eckstein and take a deep dive into the business behind some of your favorite brands. Joining Ashley will be Trevor Schultz, Founder of Loungefly, Cindy Levitt, SVP of Licensing/Hot Topic, Theresa Mercado, VP of Product Development/Hot Topic and Professor Susan Scafidi, Founder & Director of the Fashion Law Institute at Fordham Law School. Come with your questions and get ready to learn! Star Wars has always been on the forefront of the “geek chic” fashion movement by bringing iconic characters and stories to life through the lens of modern day fashion. Over the past decade, the portfolio of brand partnerships have grown significantly allowing fans all over the world to celebrate their passion for the brand with more than just tee shirts. 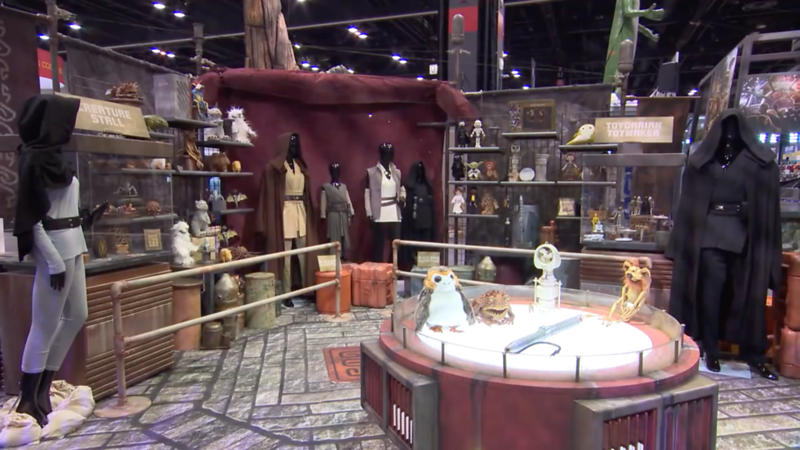 For the first time ever, get a behind the scenes look at the design & development process of Star Wars fashion & accessories with the creative leads of some of the most popular collaborations to date. The news is out and it’s huge! We are extremely excited to share with you advance information on DC Super Hero Girls graphic novels and DC Ink and DC Zoom, our new imprints for young readers. Join top talent, – Art & Franco, Agnes Garbowska, Monica Kubina, Dustin Nguyen, Danielle Paige, and special guests – as they give you a glimpse into their projects and spill secrets on things to come! Join Ashley Eckstein (Her Universe, Voice of Ahsoka Tano) and Amy Ratcliffe (Author and Journalist) as they discuss everything from Eckstein’s new book It’s Your Universe: You Have the Power to Make it Happen. Ashley will share her story and take fans through her step by step guide on how to make dreams come true. You won’t want to miss this inspiring and empowering conversation! 100 Limited Edition Ahsoka enamel pins will be given to the first 100 people in line with a book purchase. Meet the voice of Ahsoka Tano from Star Wars and Her Universe Founder, Ashley Eckstein. 50 wristbands will be given out to the first 50 people who make a purchase at Her Universe booth #2913-T on Saturday morning. Celebrate the 30th anniversary of My Neighbor Totoro, the classic animation film of childhood adventures and friendship in a magical forest. Join Her Universe and Hot Topic for Studio Ghibli trivia, prizes, and a special screening of this delightful tale. Hosted by Her Universe Founder Ashley Eckstein. Meet the voice of Ahsoka Tano from Star Wars and Her Universe Founder, Ashley Eckstein. 100 wristbands will be given out to the first 100 people who make a purchase at Her Universe booth #2913-T on Sunday morning.